Not every vehicle can stand the test of time. It takes a great design, catchy name and solid performance in order to get shoppers to keep coming back for more and pass on the good word. It’s clear Volkswagen did something right, with the 2017 Volkswagen Golf arriving in Las Vegas NV to continue on the tradition of a model that has survived more than four decades. Not only that, but it has spawned an entire Golf family to provide drivers with a variety of options for performance and family convenience. So what is it about the 2017 Volkswagen Golf that will make you turn over to VW? First, you’ll want to take a look at the simple lines and compact design that make it both attractive and easy to maneuver. Volkswagen retains a simple and sophisticated style motto that doesn’t have to oversell itself to get you interested. Open the door and take a seat in the interior and you’ll fall for what so many before you have: an elegant interior with high-quality-fitted materials and all the latest in modern technology. Finding a balance between affordable and appealing has always been a main goal for the Volkswagen Golf. This continues today with standard features that include power windows and locks, cruise control, A/C, a 6.5-inch touchscreen with App-Connect, Bluetooth with audio and a rearview camera. You’ll notice if you look through the lineup that VW turbochargers all its engines. This results in models that max out their efficiency and power for the best performance. The Golf has a 1.8-liter turbocharged four-cylinder under the hood that offers up 170 horsepower and 199 pound-feet of torque. Why would you get a hatchback if space is no issue? Sure, you might just like the look and loading convenience, but it’s hard to deny the 22.8 cubic feet of cargo space behind the 93.5 cubic foot interior. Fold the rear seats flat to open up a total of 52.7 cubic feet and pack along your sporting gear. Volkswagen offers one of the longest lasting hatchbacks on the market, with the model consistently in production since the 1970s, when it was popularly known as the Rabbit. The name may have changed, but its benefits have only improved over time. It’s roomier, more stylish and a lot more powerful than the MK1 that started it all. What will you love most about the 2017 model year? 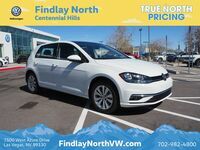 Volkswagen is putting all its efforts into honing in on value, which means you won’t find yourself debating between trims that have just that one feature you really can’t live without. There are just two trim levels for this year, the S and the new Wolfsburg. Standard features include full power functions, Bluetooth, App-Connect with Android Auto and Apple CarPlay, a rearview camera, heated side mirrors, a multi-function steering wheel and cloth upholstery. Upgrading to the Wolfsburg trim means you get more style and function, with features that include V-Tex leatherette upholstery, heated front seats, keyless access with push-button start, a panoramic sunroom, automatic headlights, forward collision warning with autonomous emergency braking, a blind spot monitor and rain-sensing windshield wipers. 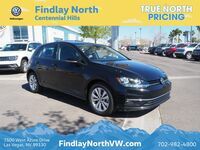 Come check out all that the 2017 Volkswagen Golf has to offer when you stop by Findlay North Volkswagen for a test drive.